The Whimsy 3 station hummingbird feeder with matching, dangling red marbles. The tubes mimic the deep flowers hummingbirds feed on in nature. Add a garden basket on the bottom hook. 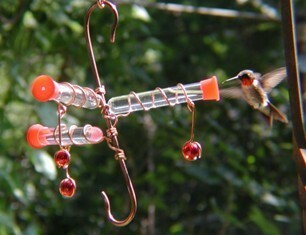 Our customers love this line of hummingbird feeders. Proudly made in the USA. Be sure to get extra test tubes and a brush for convenient filling.